In the aftermath of last week's announcement that an Alabama grand jury refused to file charges against former law-enforcement chief Spencer Collier, multiple reports said the news indicated "Luv Guv" Robert Bentley and chief advisor "Freaky Becky" Caldwell Mason were edging closer to the abyss. After all, Bentley, Mason and Co. had concocted charges of alleged wrongdoing against Collier, apparently to support their dubious decision to terminate him, and a grand jury -- which are famous for having such a low bar that they will "indict a ham sandwich" -- said, in essence, "There is no 'here' here." The Bentley-Mason crowd appear to be next in line, and the decision on Collier suggests the grand jury might not look so favorably on the guv and his inamorata. Collier said Bentley used law enforcement as a "political tool"; perhaps the more accurate term would be "political weapon." 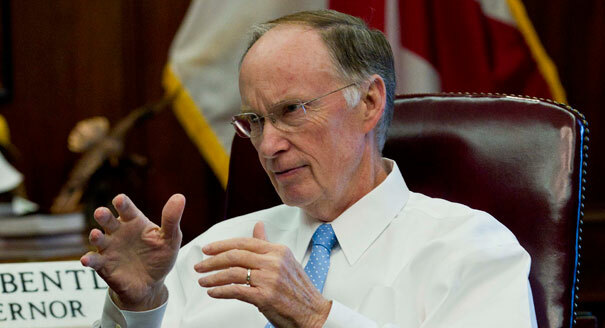 John Archibald, columnist at al.com, said "Bentley's goose is cooked." Attorney Donald Watkins, writing at his Facebook page, agreed, calling Bentley "an evil man who uses political appointees and state resources to carry out personal vendettas against those who opposed and/or exposed his lawlessness." That last part includes me, because I broke the story about the Bentley-Mason affair -- and Watkins and I did the heavy lifting on the scandal for months before the mainstream media arose from its stupor to realize our reporting was on target. In fact, multiple news accounts have Bentley and Mason making unlawful use of law-enforcement resources to target Watkins and me, in retaliation for having the audacity to practice journalism. I had reasons to see the Bentley collapse coming, but like many others, I was conned by his grandfatherly demeanor and claims to be a heavy-duty Christian. In fact, I now must admit that I voted for Bentley -- the first Republican to get my vote in roughly 20 years, and hopefully the last one I ever will support. My wife, Carol, and I did not actually "support" Bentley. But we were among a sizable number of Democrats who crossed over in the primary to vote for Bentley in hopes of blocking Riley Inc. lackey Bradley Byrne -- and it worked. We now know that Bentley's professorial exterior hides a dark and ugly soul. And I suspect its roots are in his hometown of Columbiana, the seat of Shelby County government and the place where I've spent a number of dismal and interminable days being cheated by various judges at the courthouse. Corruption in Columbiana is so commonplace and deep-seated that I suspect it's impossible to grow up there -- or live there for any length of time -- without becoming warped, at least if you are among the town's elite. It's a place where everyone with white skin is expected to think alike, where the federally guaranteed rights to due process and equal protection are beaten, thrashed, and locked in the basement like unruly orphans. The people of Columbiana are like a tribe, the kind you find in a dysfunctional nation like Iraq. ("The Kurds today built a wall to protect their homeland of Columbiana from government forces. While they were at it, the Kurds helped kick the guts out of the Voting Rights Act. 'Negroes don't need to vote anymore,' the Kurds said in a prepared statement.") They march to their own Columbiana-made rules, while ignoring the laws of the land, which govern those of us outside the city limits. In blunt terms, they are un-American, among the most unpatriotic individuals you will find anywhere outside of Mississippi, South Carolina, Oklahoma, and Kansas. 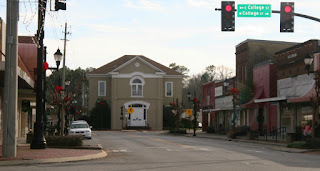 (1) Admit you are guilty of a crime and get found "not guilty"
This is the kind of thing that happens with regularity in Robert Bentley's hometown. Because of the acquittal, McGarity had minimal grounds to sue us for malicious prosecution, which means the underlying criminal case against him was brought with a complete absence of probable cause. In fact, McGarity had no legitimate grounds for a lawsuit because we had not only probable cause, but actual cause -- he admitted to trespassing, as charged. Bill Swatek, McGarity's lawyer who has been disciplined by the Alabama State Bar at least three teams (including one suspension of his license) brought the case anyway. We hired Jesse P. Evans III and Michael Odom, then from the law firm Lange Simpson (now at Rumberger Kirk and Caldwell) and paid them more than $12,000 to represent us. Evans and Odom prepared a Motion for Summary Judgment, complete with material evidence in the form of evidence from Carol, Bill Lewis, and me. McGarity was required by law to present an opposing motion, supported with material evidence, at least two days prior to the summary-judgment hearing. He presented no evidence, which means the Circuit Judge J. Michael Joiner was required by law to grant summary judgment and dismiss McGarity's case on the day of the hearing. McGarity presented a late affidavit, without seeking leave of court as required by law, and nothing in it was material to the case. The key point in such an affidavit should have been "I did not trespass on the Shuler's property." McGarity could not say that, of course, because he had admitted to trespassing in the criminal case, and we had a copy of the transcript. That was the second time Joiner was required to grant summary judgment, but he didn't do it. When a party opposing a properly supported motion for summary judgment offers no evidence to contradict that presented by the movant, the trial court MUST consider the movant's evidence uncontroverted, with no genuine issue of material fact existing." Three times, the law required Joiner to consider our evidence uncontroverted and that there was no genuine issue of material fact existing, meaning he had to grant summary judgment. He failed to follow the law three times, forcing us to go to a trial that could not be held and causing us to spend thousands in additional dollars on a case that already had been decided under the law. Again, this is what serves as "justice" in Robert Bentley's hometown. Is it any wonder that he grew up to be, in the words of Donald Watkins, "an evil man who uses political appointees and state resources to carry out personal vendettas against those who opposed and/or exposed his lawlessness." Did Bentley make the appointment because of Joiner's superior legal skills? Don't make me laugh. Joiner is one of the worst judges in the Southeast; he's unfit to judge pigs at a county fair. Bentley's action was the worst kind of cronyism. He appointed Joiner for no reason other than the two are from the same hometown, grew up in the same sheltered and dysfunctional culture, and spout the same phony beliefs in a religion that most real Christians would not recognize. With Bentley and Joiner in statewide positions, they have helped spread the Curse of Columbiana to every corner of Alabama. Bentley's removal from office cannot happen fast enough -- and a semi-competent investigation would show that Joiner needs to be right behind him. Columbiana, where men are men and sheep are scared!!! No need to post, but did you read the Al.com article on the lawsuits/allegations ongoing against a Morgan County Sheriff and a blogger? Interesting perspective given your story. "Since Morgan County Sheriff Ana Franklin began investigating and fired longtime jail warden Leon Bradley, she's been sued in federal court by a blogger. A search warrant issued Oct. 5 was used to seize computers, records, documents and files from a business in Falkville that's operated by Glenda Lockhart, author of the blog." I hear that a number of powerful folks frequent an apartment complex on 280 that has been known to house prostitutes. The place had a fire several years back, and Rob Riley was one of the lawyers who helped represent plaintiffs. Hmmmm . . . I wonder if McGarity knows how lucky he is that he hasn't been shot stone-cold dead? If your description is accurate of his actions and words toward Mrs. Schnauzer and you -- and I have no doubt they are -- I would have put several plugs in him a long time ago. And I could have made it look like self defense. You and Mrs. Schnauzer must be awfully patient, understanding people not to have exerted your Second Amendment rights on this POS. Interesting thoughts, @6:00. I'm not real big on guns or Second Amendment rights, but looking back on it now, I kind of wish we had taken the route you describe. We'd probably be in a better situation than we are now. At one time, I didn't think I was capable of killing another human being, but I definitely am capable of that now -- and McGarity is one of several people I wouldn't mind seeing their brains splattered over the sidewalk. My preference, I guess, would be for someone else to do the shooting, but if it's left to me, I could do it now -- after what's been done to us. Shelby County needs to move its county seat to a more convenient and sensible location for the majority of the population. It should be in Pelham, Helena or Alabaster, with a branch office on 280. Hell, they probably don't need a branch office in Columbiana, it's such an outpost. Could not agree more, @6:14, and you touch on a big reason why Columbiana is so corrupt. It's so far out in the sticks that no self-respecting journalist or investigator would want to go there. It's so far off the map that the tendency is to ignore it, except for the occasional spectacular murder case. That helps feed the culture of corruption. It needs to be in a location that is more convenient, and where a spotlight might be more likely to shine on it. Do I have this straight? McGarity admitted on the stand to criminal trespass, and the judge found him not guilty? I didn't think that is possible? It's possible in Shelby County, Alabama. McGarity did not use the words, "I admit I was criminally trespassing on the Shulers property," probably because he had no idea what criminal trespass meant. But he admitted to being on our property, just as Carol testified to seeing him, and he never claimed to be licensed, privileged, or invited to be there. That is an admission of guilt, when you admit to the only element of the crime and fail to claim any of the defenses. I should note that criminal trespass, third degree, is about the lowest level of crime there is. In Alabama, it's a violation, not even a misdemeanor. If we were going to make up some crime about McGarity, I guarantee it would have been for something bigger than that. You lost and you can't undo it now, even if it all happened as you say and in the light you portray it. You need to acknowledge that you own choices helped lead you to where you are now. You are not a martyr or victim, you've tried to game the system at many points hasn't served you or your wife well. "Shortly after Governor Robert Bentley placed ALEA Chief Spencer Collier on “medical leave,” an investigation into State Senator Phil Williams (R-Rainbow City) was spiked, just as it was on the verge of going before a grand jury. Special Agent Jack Wilson, who was conducting the investigation into Williams, was ordered by Wiggins to close the case file and turn it over to the SBI."